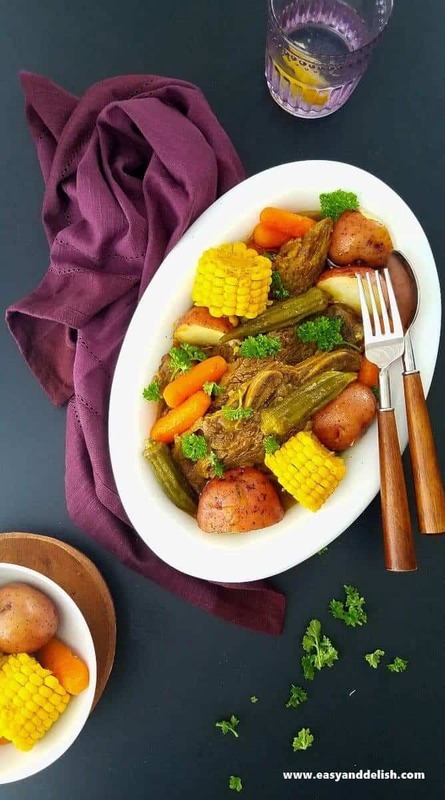 This Beef Short Rib Pot Roast is a hearty Northeastern Brazilian style stew, made in an Instant Pot with different vegetables and spices. Perfect for an easy family meal, either to serve over rice or along with your favorite side dish. If you are a fan of traditional American pot roast, you will go crazy for this Instant Pot Beef Short Rib Pot Roast — which, by the way, cooks much quicker than the classic pot roast. Don’t believe me? Check it out! 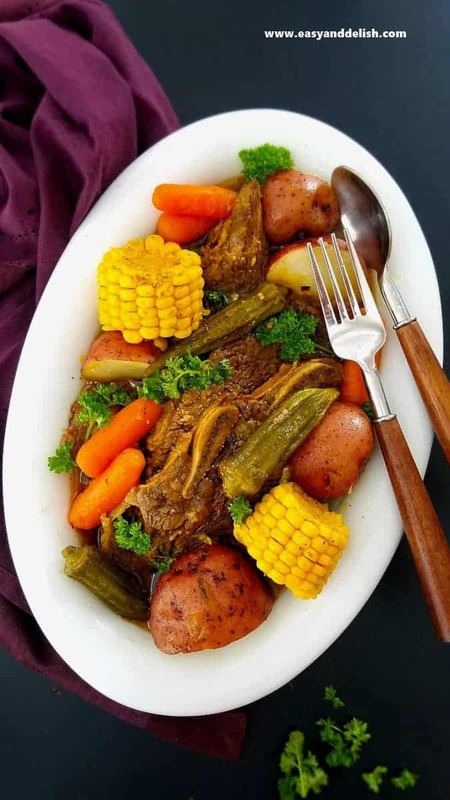 Traditional American Pot Roast is a stew made using a roast-sized, tough cut of beef such as chuck roast, which is browned, and then undergoes slow cooking in a dutch-oven pan or slow cooker until tender, along with various vegetables (potatoes, carrots, and onions). Also known as Yankee pot roast, it is a variation of the French boeuf à la mode. 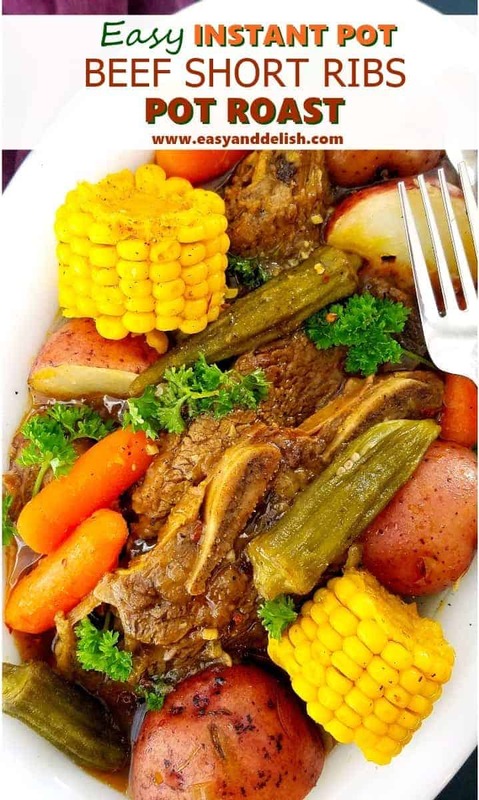 In contrast, our Beef Short Rib Pot Roast makes use of beef short ribs that are browned and then cooked in an Instant Pot with a larger assortment of vegetables, such as corn on the cob, potatoes, carrots, onions, and okra. Like its Portuguese cousin, cozido a Portuguesa, the dish has numerous regional variations throughout Brazil — from the cut of meat used to the variety of vegetables, and in some instances even the use of plantains. The version that I have for you today comes from my home state of Pernambuco, on the northeastern coast of Brazil. Down there, it is common to also have maxixe (maroon cucumber or West Indian gherkin) in the mix of vegetables, which we omit because it is not easily available in Texas. Some even add plantains, which we felt was not essential to our recipe since American corn is typically quite sweet, in contrast to the most common type of corn consumed in Brazil. The modification is just a slight one. Back in Pernambuco the dish comes accompanied by white rice and pirão (a creamy-polenta like dish made from pot roast broth and coarse manioc flour). But you can certainly serve it all by itself or along with your favorite side dish such as pasta, couscous, quinoa, mashed potatoes, etc. The spices and herbs that we used in our Beef Short Rib Pot Roast also differ from the American version. Besides salt and pepper, we used ground cumin and annatto/achiote (both available in any local supermarket in the Latin aisle, since both are also commonly used in Mexican cuisine). If you don’t have an Instant Pot or pressure cooker, no worries. You can make this in a dutch-oven pan. which will probably take a little longer to cook compared to an Instant Pot. I made this Beef Short Rib Pot Roast for the first time and my family fell in love with it. I practically transported myself back to Brazil, along with my family, who have never tried the dish before. While I had to contain myself to leave enough pirão for the rest of the family, my husband and eldest child were not crazy about it– mostly on account of its gooey texture. I guess this was somewhat to be expected, since they both are not really fans of creamy polenta or gravy. If you would like to try pirão, bring about 2 cups of the pot roast broth to a boil in a saucepan, reduce heat to medium, and then add 1 to 1 1/2 cups of coarse manioc flour (farinha de mandioca) in a steady stream, stirring constantly until it has the consistency of cooked creamy polenta and no lumps are present. You can adjust the seasoning (salt and pepper) if necessary. 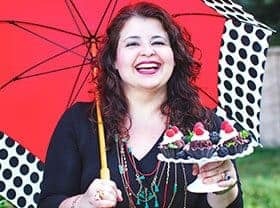 Well, enjoy a culinary trip to my beautiful and delicious state of Pernambuco through our hearty Beef Short Rib Pot Roast! 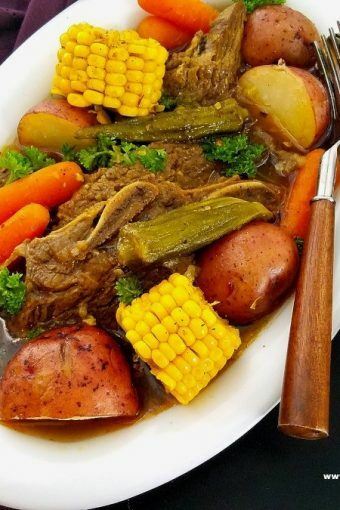 This Beef Short Rib Pot Roast is a hearty Northeastern Brazilian style stew, made in an instant pot with vegetables. Perfect for an easy family meal, either to serve over rice or along with your favorite side dish. Mix the annatto, salt, cumin, and pepper in a small bowl. Sprinkle spice mixture on the ribs on both sides, distributing uniformly with your hands. With mine, I put the instant pot on the saute function. Turn on your instant pot and follow the instructions for use. For this method, when pot has heated, add 2 Tablespoons of oil and brown the ribs in batches, about 1 1/2 minutes per side. Do not overcrowd the pan! Use a bit more oil if necessary. Transfer ribs to a plate. Add remaining oil and saute the onion and garlic for about 2 minutes, stirring every now and then. Do not let them brown. Stir in the tomato paste and water, scraping the pot down with an wooden spoon. Add the ribs back with their juices, cover, and set to cook for about 30 minutes. For this I used the meat function of my instant pot. If you would like to cook in a dutch-oven pot, please read NOTES at the bottom of the recipe. When the 30 minutes has elapsed, carefully turn valve to fast release, letting all the pressure out. Safely open the pot and add all the vegetables, making sure to submerge them into the liquids as much as possible, principally the corn and potatoes. Cover and set on the vegetable or poultry function for about 8 minutes. Again, carefully turn valve to fast release, letting all the pressure out. Safely open the pot, taste, and adjust salt and pepper if desired. Squeeze in the lemon, stirring carefully. Sprinkle chopped cilantro/parsley. Serve with white rice and pirão (a creamy-polenta like dish made from pot roast broth and coarse manioc flour) OR instead with mashed potatoes, creamy corn polenta, grits, pasta, couscous, quinoa, etc. TIP: pirão recipe is above (post text). DUTCH-OVEN PAN: If cooking our beef short ribs pot roast in a dutch-oven pan, brown ribs over medium-high heat, about 1 1/2 minutes per side, working in batches to avoid overcrowding the pan. When cooking onion and garlic, reduce heat to medium, letting them cook for 2 minutes and stirring occasionally to prevent from browning. Once tomato paste and water are added, bring to a boil over medium-high heat and then reduce heat to medium-low. Cover pan, and let ribs cook for about 35-45 minutes or until almost tender. Add the vegetables, making sure to submerge the corn and potatoes as much as possible into the liquids. Cover the pan and let cook over medium-low heat for 10-15 minutes or until vegetables are cooked and ribs are very tender. Wow, this looks SO good! Love short ribs, and you’ve really spiced them up in this dish. Good stuff — thanks. This a hearty delicious comfort meal! My type of dish! I just got an Instant Pot and am loving it! What a savory and flavorful short rib dinner. Love the okra too! This is definitely something that I’ve never had but it certainly sounds like I should.